Be bold in defending the gospel and the Church, Elder Walter F. Gonzalez of the Seventy counseled young single adults in a regional Hispanic fireside. He reminded the young adults that they — as Latter-day Saints and as Hispanic members — are in a minority. Speaking on Sunday Oct. 18 during the meeting held in the Salt Lake Sugar House Stake Center, he said that when President Gordon B. Hinckley called him to Utah he thought, "I will finally be among the majority." He said he learned, however, that there are plenty of opportunities for missionary work in Utah. Elder Gonzalez advised the young adults to be as accomplished as they can. 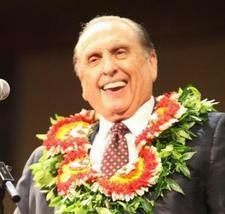 "You can be accomplished in education and knowledge but also in the gospel," he declared. "Knowledge is power, particularly knowledge of the gospel."